As a ligament injury was suspected to be the cause of the patient’s symptoms, a magnetic resonance (MR) imaging scan of the ankle was performed with a high-resolution surface coil on a 1.5-tesla (T) scanner. The scan revealed a well-corticated, triangular bone posterior to the talus. This represented an os trigonum (accessory bone). The image also revealed patchy, altered marrow signal, which appeared hypointense on T1-weighted images and hyperintense on fat-suppressed T2-weighted images, suggesting bone marrow edema (Figure 1). 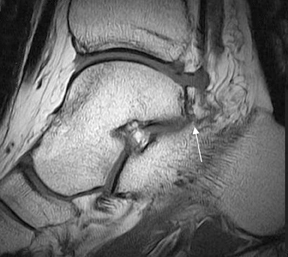 The talus/os trigonum synchondrosis appeared intact, although subchondral erosions were present along the articular margins (Figure 1). Ill-defined hyperintense signal was seen in the soft tissue around the os trigonum on fat-suppressed, T2-weighted images (Figure 1). The anterior talofibular ligament appeared swollen and hyperintense, suggesting a contusion, but otherwise intact (not shown). Ill-defined hyperintense signal was also seen in the subcutaneous tissue along the lateral aspect of the ankle on fat-suppressed, T2-weighted images, suggesting edema (Figure 1). The other bones and ligaments surrounding the ankle joint appeared normal. Patients typically present with recurrent posterolateral ankle pain, especially on plantar flexion, and sometimes on weight bearing,along with swelling and stiffness of the posterior ankle. Symptoms are relieved with rest. During clinical examination, reproduction of pain on forceful plantar flexion and sometimes on resistive plantar flexion or dorsiflexion of the big toe are considered hallmarks of PAI syndrome.7 Symptoms resolve with injection of local anesthetic into the posterolateral aspect of the ankle. In chronic cases, the range of motion of the hallux may be reduced as a result of fibrosis of the flexor hallucis longus tendon, which sits between the medial and lateral talar tubercles. Radiographs can reveal an os trigonum or Stieda process. Lateral radiographs obtained with the foot in plantar flexion may show the os trigonum or lateral talar tubercle impinged between the posterior-tibial malleolus and the calcaneal tuberosity.3 MR imaging is the modality of choice for further evaluation of the bony and soft tissue structures. 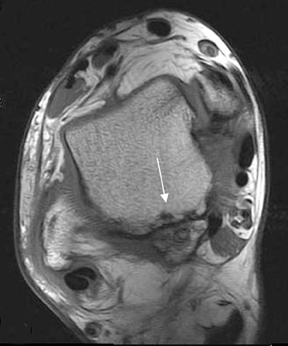 MR imaging demonstrates bone marrow edema within the os trigonum and at synchondrosis with the posterior talar tubercle, a reliable sign of PAI syndrome.3,8 Other common sites of edema include the posterior talus (40%) and the posterior calcaneum (24%); diffuse patchy-marrow edema can appear throughout the hind foot.8 MR imaging can reveal fracture through the os trigonum or fluid in synchondrosis, indicating os trigonum fracture. Tendinitis of the flexor hallucis longus and posterior impingement of the ankle are familiar to the orthopedic surgeon who treats professional dancers. However, a lack of familiarity with these conditions, a low index of suspicion with regard to patients who are not dancers, and the usual resolution of symptoms after modification of activity or rest probably contribute to the low reported prevalence in non-dancers. MR imaging has a marked effect on clinical care by enabling the determination of the exact nature of the osseous- and soft-tissue lesions and by excluding other causes of posterior ankle pain. In conclusion, soft-tissue abnormalities and bone contusions of the lateral talar tubercle and ostrigonum are findings of PAI syndrome, which can be clearly depicted on MR imaging. Wredmark T, Carlstedt CA, Bauer H, Saartok T. Os trigonum syndrome: A clinical entity in ballet dancers. Foot Ankle. 1991;11:404-406. Masciocchi C, Catalucci A, Barile A. Ankle impingement syndromes. Eur J Radiol. 1998;27: S70-S73. 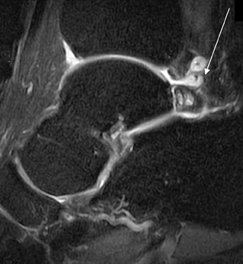 Bureau NJ, Cardinal E, Hobden R, Aubin B. Posterior ankle impingement syndrome: MR imaging findings in seven patients. Radiology. 2000;215:497-503. Rosenberg ZS, Cheung YY, Beltran J, et al. Posterior intermalleolar ligament of the ankle: Normal anatomy and MR imaging features. AJR Am J Roentgenol. 1995;165:387-390. Robinson P, White LM. Soft-tissue and osseous impingement syndrome of the ankle: Role of imaging in diagnosis and management. Radiographics. 2002;22:1457-1469. Karasick D, Schweitzer ME. The os trigonum syndrome: Imaging features. AJR Am J Roentgenol.1996;166:125-129. Hamilton WG, Geppert MJ, Thompson FM. Pain in the posterior aspect of the ankle in dancers. Differential diagnosis and operative treatment. J Bone Joint Surg Am. 1996;78:1491-1500. Peace KA, Hillier JC, Hulme A, Healy JC. 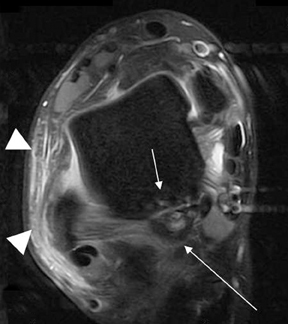 MRI features of posterior ankle impingement syndrome in ballet dancers: A review of 25 cases. Clin Radiology. 2004;59:1025-1033. Posterior ankle impingement syndrome due to os trigonum. Appl Radiol.